Last time we discussed the importance of understanding your booth and set-up needs before you design your display boards. Now onto designing the actual display boards. I currently have two different heights of jewelry display boards – a set that is about 18 inches tall and another set that is about 40 inches tall. The boards are designed to be used in two very different shop set-ups. 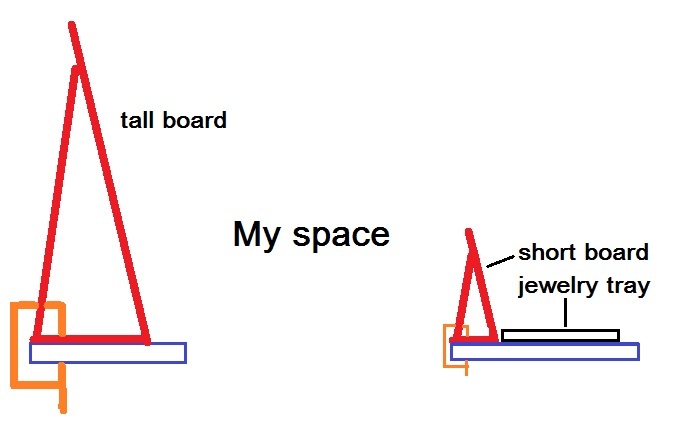 If I am in a small space where I need to stand behind the table and reach over to talk to customers and do transactions, I use the short boards. When you are designing your boards, consider the board height and the length of your arms. I could have made the boards a little higher, but I wanted to COMFORTABLY be able to reach over them to wait on customers. Comfort becomes an important consideration when you are on your feet for hours at a time. When there are no customers around, the short boards still allow me a clear view of the display and the ability to welcome and interact with customers without standing up. This arrangement also allows me to set another tall board behind me for even more vertical display space when I have a slightly deeper booth. Before we go on to final board design, I need to mention the table that you will be using. When you rent a space at an inside show, it may or may not come with table(s), a tablecloth, a chair, and a trash can. Outside shows normally only rent you a piece of ground and you are responsible for your entire set-up. If it is your own table, you have complete control over the height and appearance of the table (more on that in an upcoming blog). Be sure that you know how tall your table will be when you design your display. If you design the board for a 30 inch high table and wind up using a 36 inch table you may not be able to reach over the display board comfortably. So what kinds of material can we use to make a display board? Probably the most common material is plywood. It is readily available, easy to cut, flat, and sturdy. So what are the downsides? It can be heavy if the boards are large, the surface must be covered in order to give a finished look, and the plywood can warp. You can make your boards out of metal sheeting, as long as you stiffen the edges with a frame of metal channel or bond the metal sheet to a sheet of plywood for stability. Using metal sheeting eliminates the need to cover the board and allows you to use magnets to attach items (as long as the sheet of metal is an iron alloy – check to make sure it works with a magnet before you build your board). I don’t use plastic sheeting for any of my boards. The need for an additional frame, the tendency for plastic to scratch easily, and the fact that some plastics warp in the heat just made it too difficult. This entry was posted in Jewelry, Vending at Events and tagged art show booth design, art show displays, craft show booth design, craft show displays, designing display boards, display boards by Eirny. Bookmark the permalink.